So I went through all this trouble back in February to check out John Doyle's production of the Brecht/Weill Mahagonny at the LA Opera and never even wrote about it! The first question on everyone's mind at the time was whether Doyle's gambit of casting musical theatre stars Audra MacDonald and Patti LuPone (yes, that's her above right) would succeed in such a demanding operatic score. But it should also be remembered that while Weill did want Mahagonny performed in opera houses, both he and Brecht insisted that theatre-trained actors were preferable than classical opera singers to bring out the character of the music and lyrics. MacDonald's voice easily satisfied the opera buffs, I think. Not surprisingly, in case anyone's forgotten, hers is a naturally beautiful classical soprano voice. And despite what people now assume from Lotte Lenya's later recordings, the role of "Jenny" (not to be confused with Threepenny Opera "Jenny") was written for a soprano. When Lenya was a soprano, that is. My main curiosity in the production, though, was to see Doyle's vision of the town of Mahagonny itself--the place where everything is allowed, except going broke. 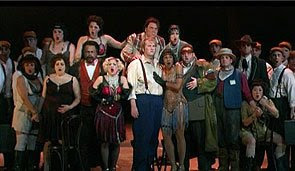 The shorthand description of his concept would be Mahagonny as Vegas. And the design evoked that beautifully. The desert motifs (already in the text), the chilling hollow neon everywhere. It actually felt right to me, even though perhaps too technological, which can distract from the raw human cruelty at work in the story. Doyle embraced technology in many places. In the finale he digitized the closing placard slogans of the marching song on a running "crawl" above the stage. Most conspicuously, the trial scene became a kind of Court TV spectacular, with live projections on the back wall of the key players. (I for one was glad in my nose-bleed seats, since I finally got to see faces!) Such mass-media allusions sort of missed the mark since Mahagonny's isolation--as an island of sin, a lawless no man's land--is essential to the narrative. But the moment had its satiric punch. And punch is what Doyle succeeded in delivering, which is not easy with this unwieldy opera/theatre hybrid. These techno-moments were indeed jarring. Perhaps not "alienating", but they indeed made Mahagonny strange again. The piece was at once made strange, and therefore fresh. What saved this from gimmickry (aside from the fact there just wasn't enough of it to become a gimmick--most of the staging is pretty straightforward, as in all traditional opera houses) was Doyle's undoubtable understanding of the play. My favorite moments were these haunting tableaus, where all these dazed denizens of Mahagonny (in their trademark John Doyle black suits, white shirts and ties--little 50's conformists) just sit there staring into space, waiting out the hurricane. The visual underscored perfectly the sense of utter spiritual emptiness in the music and eerily captured the hangover that always ensues after economic gluttony. If Mahagonny is one of those things you always meant to see or read but never did, this is your chance. So check it out. Or DVR it. It's free! And it's on tv. And after you've watched it--tell us what you thought! The thing that struck me the most about the production was the way the Opera folks tried to sell it as a piece by Weill with only minor contributions by Brecht; if any piece ever had Brecht's aesthetic plastered all over it, it's this one. But then, he's only one of the most influential writers of the 20th century; no reason to upset the operaphiles. Yeah it's super fashionable to dismiss Brecht as a sexist, manipulative immature hack these days but what can you do.